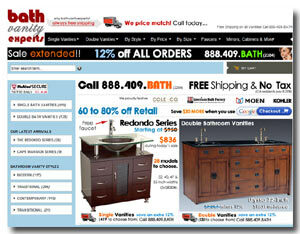 Unlike other online stores, they carry a premium selection of hundreds of vanities ready for immediate shipment. Due to the fact that every one of their products is stocked there is no waiting period. They feel that this aspect is significant because their valued customers, if planning a bathroom remodel or upgrade, will always receive what they want, when they need it. With over 30 years of experience in the field of bathroom furniture, sales and marketing, their team of experts is there to make sure you find the bath vanity of your dreams at a price you can afford. Based in Southern California, their team works around the clock to make sure that you not only find the right vanity, but also are happy with the entire process from start to finish. Their job isn't done until you are so excited about your new bathroom that you end up telling your friends, family and neighbors about how you were treated like family at BathVanityExperts.com. Please feel free to call their customer service line day or night at 888-409-BATH (2284) for any questions you may have.